Escape from the crowded tourism destinations and rent a private villa with a swimming pool on Menorca. Holiday means, to me and to many people, having a moment to avoid the daily fuss or making time for you, your family and friends. It means no colleagues from work asking for help and avoiding all the troops of compatriots. But maybe it means something different to you? You enjoy packing your suitcase with courage while being already in a holiday mood? And then, you arrive at your holiday home with a big smile on your face and with your day already made. While the sun shines, the lounger near the pool looks very comfortable. You take a nap and, while you sleep, you hear some voices in the background. Wonder by wonder, the first arrival of compatriots! It's a group of your friends with one of your colleagues. The chance that this would happen on Menorca (Minorca) is non-existent. "La isla verde y azul" (the green and blue island) is still not visited by mass tourism. This is actually unjustified, because of all the attractions that Menorca has to offer. For a summer holiday the temperatures are very pleasant. The average temperatures remain between the 20 and 28 degrees, so the heat won't make you sweat every time you want to do something. The entourage of Menorca is breathtaking: the virginal and diverse landscapes and the several cultural and historical gifts are unique, such as the variety of beaches and bays. There's as much as in Mallorca and Ibiza together! Menorca gives you a warm treat with its preference for the beauty of nature and its cultural atmosphere. For horse amateurs, this is the right island. Menorcan horses are internationally famous as Menorquin and they've been, for centuries, one of the most important activities on the island. You'll easily find riding and managing schools all over the island and you'll be able to make a ride in the nature. The menorcans are lively, open-minded and take care to offer you and your family a wide selection of activities on. There's paid much attention to water sports (diving, sailing, water scooters, etc) and to sports in general (trekking, cycling, mountain bikes, golf...). All this is possible because of the islands' purity. Are you travelling with kids? Menorca is very child-friendly. The beaches slope down little by little, so there are many possibilities to spend a fabulous holiday with your kids. You can, for example, visit the Aquacenter Menorca (a Water Park), the Lloc de Menorca (a zoo) or the karting circuit Costa Nova. We also recommend the combination of a boat trip with a day on the beach. What are you going to do this summer during your holiday? Who doesn't dream of having countless possibilities in an ultimate holiday? In fact, a summer holiday is the only real and deserved holiday after a year of hard labour. Or maybe you are one of those privileged that, after years of hard work, you can afford several holidays a year? Nevertheless, a summer holiday is something you're looking forward for a long time and in which you want to make the best of it. It's also a moment to relax and load up for the rest of the year, so Menorca is the indicated place to go to. Menorca has a Mediterranean climate with warm summers and mild winters. The pure island of Menorca is situated on the Mediterranean Sea, with in summer time an average temperature of 28 ºC. The whole summer, there are many sunny hours and very little rain fall. Tough, during the mild winters, there's some rain (with an average of 550 mm a year). Nevertheless, this is only from October till April, with in October the so-called Tramuntana wind. To surfers, this is a really exiting moment. The force of the wind can be till 150 km/h, on the north-west. And the good news, about the Tramuntana, is that it's always followed by nice weather! Which beach steels your heart in Menorca? With more than 11 hours of sunshine a day, in the summer, and a lot of beaches and bays Menorca is the nicest island. Every day, you'll visit another beach or bay with a very different view. You can find diversity until the last detail, in Menorca. The north-east is rather hilly and the coastline is irregular with many bays with rocks. The most beautiful beaches are situated on the south of Menorca with small creeks and green woody areas. In a few villages or towns, there's a little train that brings you to the nearest beaches. So you don't have to walk or climb the hills, through their stairs, with all the beach stuff that you take. You have plenty of options. There's a perfect beach for everyone (with many different atmospheres). Where do you feel like going today? Playa de Son Bou is at the smallest costal village. It's a large sandy beach with: showers, WC, parasols and sun loungers for rent, life guards during the high season, water sports, a beach bar and, in the most western area, a nudist beach. Punta Prima - It's a large beach with white sand, with a regular strong under stream. It has few facilities but some restaurants, beach bars and shops. Cala Blanca - It's divided into 2 small sandy beaches in a quiet location. You'll find some shops and restaurants there. Cala 'n Porter - It's a fine white sand beach, with crystal clear water, which makes it ideal to snorkel. It has life guards during the high season, a few bars, WC, a road train that reaches the beach, sun shades and sun loungers for rent and pedalos. Cala Virgenes - It's a protected bay reachable by foot or by boat. It's comparable to Cala Turqueta, Algaierens, Cala Macarella or Vala Mitjana. Binibequer - With its quiet situation, it has a beach bar, sun loungers and parasols for rent, pedalos, water scooters and kayaks. Cala d'Algaiarens - It has an attractive and quiet situation (except on during the week-ends). It can be reached from La Vall, with toll-highway. S'Arenal de Morella - It's a pure virginal area with fine gravel sand. It's nearby s'Albufera des Grau and the lighthouse in Favoritx. - Cala'n Bosch: It's a very popular touristic area with a bay of white sand beach, a harbour with glass bottom boats, a children playground, a shopping centre, bars, restaurants and sun loungers and parasols for rent. - Sant Adrià: It's a small bathing paradise, with not that many facilities, some shops, bars and restaurants. - Cala Tirant: It's behind the dunes and a wetland; you can take a catamaran or windsurf there. - Arenal d'en Castell: It's a little beach, with many sport facilities, shops and supermarkets. You'll find it next to the centre Coves Noves and it has shallow waters. It's very popular with families. You can try water bikes, motor boats or surf planking there. - Es Grau: It's a bay with fine and plane sand, the water is rather calm there. - Cala Santa Galdana:It's one of the most beautiful beaches, surrounded by pines and rocks. It has some beach bars. Menorca is extraordinarily beautiful. You'll find there many cultural heritages, which will make walking around the villages and towns a pleasure. Imagine yourself already in the capital of Menorca, experiencing the Menorcan world. You start your walk at the harbour of Mahon, one of the biggest harbours in the world. Then you continue to the magnificent and enormous fortress, "la Fortalessa de Mola" (or "la Fortaleza" from Isabel II). From this fortress, you'll have the most wonderful view of the peninsula la Mola. From the bird sanctuary, you'll see Menorca's skyline and its harbour. The city Mahon (also known as Mao) is certainly worth a closer look. Do yourself a favour and take a walk in the car-free zone, which brings you to the cultural heart of Mahon: Plaça d'Espanya. On the square, you'll enjoy on both sides examples of historical and architectonic treasures, like the Iglesia del Carmen, on the east side. This church was built on the foundations of a gothic church of the 13th century. On the 18th century, the Iglesia del Carmen finally got its right to exist. But the church was extremely damaged during the Spanish civil war. Thanks to a very careful renovation, the building recovered its actual state and is considered the most important religious monument of Menorca. Besides, it attracts many visitors, thanks to the historic heritage Hernandez Mora. This local writer and teacher was very committed to the conservation of Menorca's history. Take some fresh air and join the locals! You'll meet them on the market that's at the monastery buildings, next to the Iglesia del Carmen. Meanwhile, seize the opportunity to buy some Mahon cheese, smoked ham or typical sausages. They're delicious and you can take them to your holiday home. Get more inside the Menorcan ambiance and visit the church of Santa Maria in Neo Classic style. Besides the altar, the organ, with it's 3.120 pipes, will certainly catch your attention. Menorca has a beautiful architecture. The locals are very proud of their Teatro Principal, the oldest opera building of Spain. Take a look at it and observe how unique it is. The charismatic influences from the antiquity are given by the Italian architect Giovanni Palagi who also gave high technology and design to the building. The programme of the opera offers cultural activities for all ages with dance and theatre performances. Not the mention, the famous voices of altos and tenors that sound regularly in this building. Besides the capital of Menorca, you can't miss Cuitadella. This former capital unfortunately has few heritages of the Romans and Arabians who ruled the island in earlier times. On the contrary, you'll spoil yourself in a cosy city. In its narrow streets, you'll see stately mansions from the 17th century like Can Saura. Along the squares, there are beautiful churches, palaces and monumental buildings in baroque and gothic style. Don't forget to visit Plaça d'es Born! You'll admire there several shops, terraces and restaurants. To start a photo safari through all the architectonic high lights, begin there and continue to Palau de Torre - Salau. Once you'll have viewed the building from the outside, take a look inside. You won't find many remains from before the 14th century. One of the exceptions is the cathedral, which was built where there use to be an ancient mosque. This particular cathedral is located on the Plaça Pio, in the area of a street named Ses Voltes, one of the main streets of the old city centre with a passionate Moorish atmosphere. Tired of walking? Time to take new forces, the Plaça Nova is just behind the corner, so choose the nicest terrace of the city. Do you enjoy good gastronomy? Then, pay a visit to the fisher's village Fornells, because this place is very famous because of its exclusive fish restaurants. Due to the high quality of the meals, even the king of Spain, Juan Carlos, is a regular client. The dishes aren't but if you like lobster, the "caldereta de llogosta" (stew of lobster) is delicious. If you prefer water sports, Fornells is also the place to be. Enjoy a diving excursion in the undersea world or discover it from above on a kayak. Your past turns you into what you are. What about the history of Menorca? Come and discover it in the museums of Menorca. - Museu Diocesa de Menorca: It has more archaeological discoveries. - Bibi seus: Enter the Menorcan life and sit down to taste the local cuisine. Suggestions: Just like the shops or other places of interest, the museums have their opening hours; check them in advance to avoid standing in front of closed doors. In the wide nature, there's also culture. After all, it's where everything started. But first of all, there's another question: Do legends exists or are they invented by humans to let the story complete? The legend of Naveta d'Es Tudons is about 2 giants that fighted for the love of the same young lady (something very typical in this type of legends). The legend tells the story about the construction of the "Naveta". While one of the 2 giants started the building, the other was digging to find water pit. The one who finished first the job would marry the lady. The story says the second giant found first water, but that, at the end, the other giant got so jealous that he killed him with the last stone of la Naveta. Until today, this last stone is missing. Actually there are few indications about the existence of giants. So it's not that surprising that the Naveta d'Es Tudons (one of the most important grave monuments from the bronze age) is 3000 years old. The collective tomb has the form of a boat reclined upside down, has a length of 13 meter, is 6 meter wide and consists of 2 floors. When the archaeologists discovered the grave monuments, they also found human rests, jewels and other gifts. 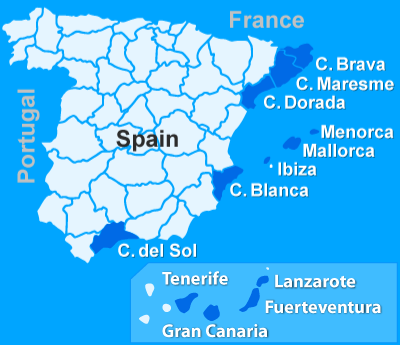 More discoveries from the Talayotic culture are located in Trepuco, Talati de Dalt, Mao, Torretrencada, Torre Llafuda, Torre d'en Gaumes and Torralba d'en Salord. It's a fabulous area, where you'll find the rests of the Talayotic age, during a promenade on the trails in the 7 km large canyon. The trails are slithering across the park and there you'll pass by a ruin. Don't forget to look up between the trees or from a higher rock. In Barranco d'Algendar, if you are lucky, you'll see eagles and vultures. The biggest cave of Menorca is situated in the canyon of Barranc de Binigaus. The Cova des Coloms had an altitude of 15 meter and a length of 110 meter. This cave has a similar form to a cathedral, which has given to it this nickname. After visiting the cave, nearby, there's the beach of Binigaus (nudist beach) where you can refresh yourself in the sea. Only the journey to this impressive cave is already worth the effort. Once arrived in the cave, you'll be overpowered by the imposing stalactite formations. Cova Polida has a wide of 16 meter, 24 meter high and 11 meter deep and is only accessible by a water route. - Geysers are more frequent on the Canary Islands, but the ones in Menorca are really special. The "bufadors" are active thanks to a system of caves and corridors. It's not considered volcanic activity. Come and see the "bufadors" in action, on the western side of Cala en Forcat. - High, higher, the highest. The highest point of Menorca is Monte Toro (357 meter high). This place is famous because of the legend of a bull that leaded a group of monks to the statue of the holy virgin. Which explains the name of the statue Verge del Toro. Besides this, a very big statue of Christ will catch your attention. The statue is placed there in memory of the Menorcans that died during the war in Morocco, at the beginning of the 20thcentury. You'll reach the Monte Tore from Es Mercadal, by very steep and slithering road. During the climb, and when you arrive at the top, you'll enjoy an amazing view. When the weather is good, you'll see the whole island and the Serra de Tramuntana of Mallorca. So this trip is really worth. Besides Monte Toro, there are two other peaks: s'Enclusa (274 meter) and Santa Agueda (264 meter). Children enjoy themselves easily as long as there's something to do. On the islands, you can find several water parks and children theme parks. A day with the whole family to Aquacenter Menorca (in Los Delfines) is always fun, especially if you like water slides. If you look for more diversity then Aquarock (in Cala 'n Bosch) is the place to be. Besides of the water fun and springboards, there's also a small karting track. For those who like bigger toys, you can also go to bigger tracks. If you're not in the neighbourhood from Cala 'n Bosch but you want to test your speed on the kart track, you can be the number 1 on the track of Menorca Aeroclub or in Karting Costa Nova. Menorca's animal kingdom can be found on a jeep safari or on a bus trip along the island. But do you prefer to do your own thing? Or rather take a shorter trip where you kids can watch the animals? Then visit all together the zoo Lloc de Menorca. On Menorca, in some cities and villages, there's the possibility to take a road train that takes you to nice and interesting attractions. It's a practical idea, if you have kids. There are many interesting high lights to see on the ride and you can jump in or off whenever you like. For just a few Euros, you'll see many places while you spend a lovely day together with your kids. On warm days, it's very pleasant to be on the sea with a soft breeze. A trip with the glass bottom boat gives you the possibility to look deep under water. Something very curious! Another way to spend your day on the water and explore the area is a trip by catamaran or sail boat. Menorca offers a great diversity of water sports. Especially: wind surfing, sailing and kayak (which are the most popular in Menorca's coast). Enjoy the wonderful undersea world. Dive and watch this undersea paradise through your goggles, with a snorkel and fins. Water sports are possible in several coastal villages; you'll find them in Ciutadella, Mahón, Fornells and Cala 'n Bosch. The landscape of Menorca is lightly accidental, so another option to discover the island in a relaxing way is the bicycle. In contrast with other areas of Spain, Menorca is made for cyclists because you'll find bicycle paths all over the inland. Golf and tennis are still very popular. There's an 18 holes golf course (par 69) and a large offer of tennis courts in the Golf Son Park (part of it is a nature park). In the high season, it's recommendable to book in advance, especially during the mornings and evenings. Hipòdrom Municipal de Mahó (Mahon), Hipodrom Torre del Ram (Ciutadella), Son Martorellet (Ferreries), Escola Eqüestre Menorquina (Ciutadella), Club Hipic sa Crueata (Es Migjorn Gran), Centre Eqüestre Equimar (Mahón), Grup de Cayallers de Maó(Mahón), Club hipic Maó (Mahon) Can Pouny de Biniac (between Mahón and Alaior), Club Hipic Alaoir(Alaoir), Federació Hipica Illes Balears (Es Mercadal), Club Hipic ses Ramones (Es Mercadal) Menorca a Cavall (between Ferreries and Es Mercadal) or Club Hipic Ferreries (Ferreries). In the smaller towns and in the villages, there are local shops where you'll certainly find some nice souvenirs to take home and to let your friends and family enjoy too from your great experiences of Menorca. In the bigger cities, like Mahón and Ciutadella, you'll find bigger shops and boutiques. If you want to find everything, without running from shop to shop, then visit one of the local markets of Menorca. During the summer season, there's a daily market in Ciutadella and of course, during the whole year there's a weekly market. On the Paça Librertat, there are 2 indoor markets to shop whatever you want to. The biggest handcraft and fish market on the Plaça Espanya: Tuesday - Saturday from 7.00 am till 2.00 pm. Port de Mahón (harbour of Maón): from 1st of Mai till 30th October, daily from 10.00 am till 8.00 pm, with clothes and souvenirs. Weekly market: from the 1st Friday of June till 1st Friday of September from 10.00 am to 2.00 pm and 6.00 pm to 10.00 pm with handcrafted articles, from lunchtime this market is animated by music. Festa de Sant Joan (23 and 24 of June, in Ciutadella). The first day is the horses day: together with their riders they demonstrate all kind of disciplines of taming. On the second day, there's a spectacular competition, which consists of 3 parts: ring sticking, jousting where they have to break a wooden shield and gallop arm in arm. Festa de Sant Llorenç (2nd week of August, in Alaior) - There are several dance, music, theatre and horse performances. Semana Santa starts with the procession on Holy Friday. This procession takes place in total silence with exception from some desolate music. Menorca is not Ibiza or Mallorca; that applies to its nature, culture but also its night-life. But that doesn't mean that there's nothing to do during the evenings! Around the harbour of Mahon and in the centre of Ciutadella, you'll find most of the clubs and bars. Menorca wouldn't be Menorca if it didn't give a special Menorcan touch to it. Sa Cova d'en Xoroi is an exclusive club, situated in one of the caves near the cliff of Cala'n Porter. It hosts international DJ's, has live performances and the music is the best. This place is also famous because of its delicious cocktails. At the terrace, you'll find a relaxed atmosphere, with the sunset or sunrise on the background. Just like the other Balearic Islands, you can reach Menorca by ferry, from the mainland, or simply take the plane to Menorca's Airport (also known as Mahon Airport, IATA:MAH, ICAO:LEMH). During the summer, there are good bus connections on Menorca. It's the perfect way to travel cheap and visit different places. Don't forget to check the time schedules and know at which time passes the last bus! Do you prefer more independence? Taxis are the most comfortable way. On the other hand, it's always funny to wander across the streets and see more of the surroundings, usually when you get lost you discover more places. Renting a scooter or a motorbike is also a pleasant and practical idea because of the nice temperatures. If you combine all the ingredients to have a unique and relaxing holiday, you'll have the recipe for Menorca. You can go incognito on a holiday, without being reminded of your home. The sun always shines and there are many things to do on the island. Wherever you look for a rest on Menorca, the sun rays will be there during 315 days a year. Even if you are relaxing on a sun shade near your private pool or if you're enjoying a home made barbecue at noon. The Menorquin (the Menorcan horse) is also ready for you. Go in full gallop along the beach of Menorca or walk in the splendour of its nature. Are you travelling with your kids? Then challenge together the slides in one of the Water Parks of Menorca or speed over the kart track. Take your chance and let yourself be suprised by Menorca, the island that is (not yet) taken over by mass tourism. Press on one of the orange buttons on this page. Next, choose your holiday villa at Club Villamar using the search option, it will show you all the villas that are available, the prices and of course more information about the villas itself.